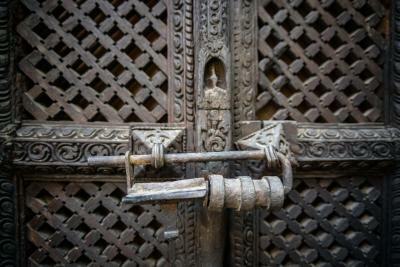 Lock in a great price for The Dwarika’s Hotel – rated 9.3 by recent guests! 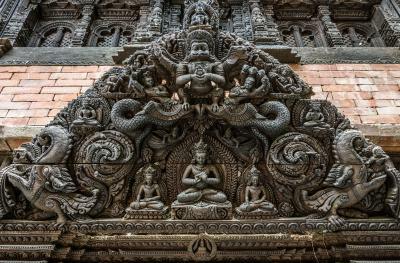 The family responsible for the preservation of the historic architectural features of a most extraordinary place are to be commended. Three generations preserving an international treasure. One of the finest hotels anywhere in the world. Good period furniture and architecture. Friendly staff. Close to airport. Staffs, services, location, Cleanness, Food, everything was wonderful..... Good Job Dwarika's Management. Amazing hotel, pricey but definitely worth it. 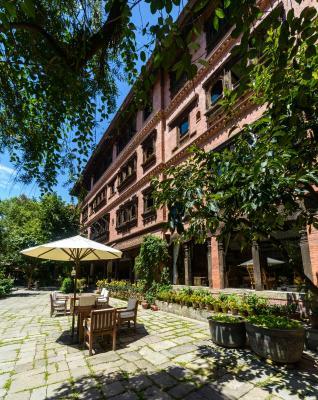 After trekking for two weeks we got to this hotel and it was like a heave on earth. We loved our room, attention to details, morning yoga class, breakfast - but most of all the breathtaking architecture and gardens. It’s one in a lifetime experience, and we don’t regret any money spent on our stay there. Recommended ! 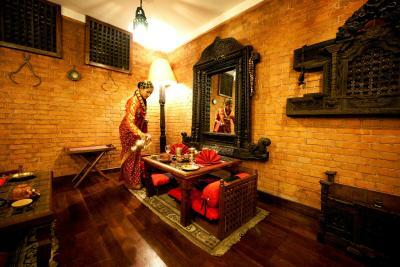 Spacious guest room decorated with traditional Newari culture. Invigorating morning Yoga class. Refreshing swimming pool with crystal-clear spring water. 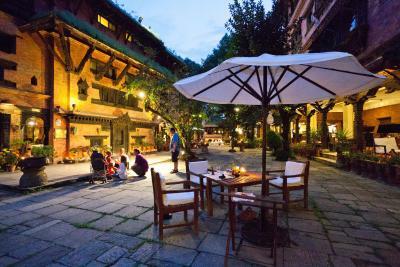 Authentic Japanese and Nepali restaurants. Friendly staff with warm hospitality. 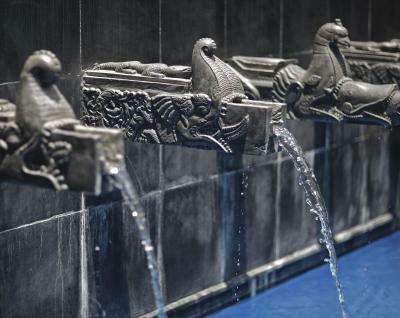 This hotel is an oasis. 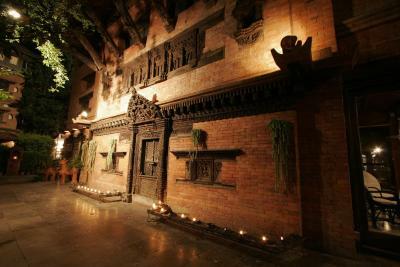 A truly remarkable experience that serves as a refuge from the hustle and bustle of Kathmandu. Stunning property with great facilities and staff. It was a mini oasis from the hectic streets of Kathmandu. Highly recommend having a meal in their restaurant, Krishnarpan. 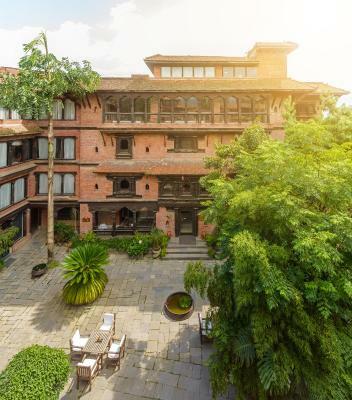 The Dwarika’s Hotel This rating is a reflection of how the property compares to the industry standard when it comes to price, facilities and services available. It's based on a self-evaluation by the property. Use this rating to help choose your stay! 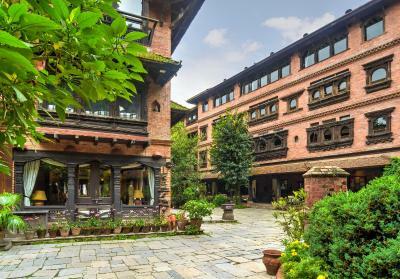 Winner of the Pacific Asia Travel Association (PATA) Heritage Award, Dwarika's Hotel is inspired by Kathmandu Valley’s rich cultural heritage. 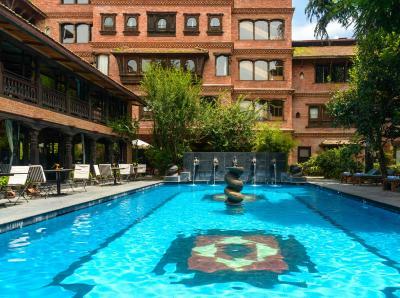 It features an outdoor pool and 4 food and beverage options. 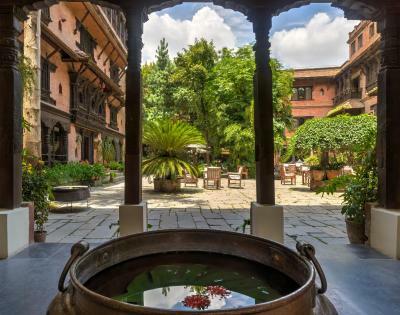 Featuring an extensive collection of artifacts from the 13th century, Dwarika's Hotel is modeled after the palaces of Newar Kings. 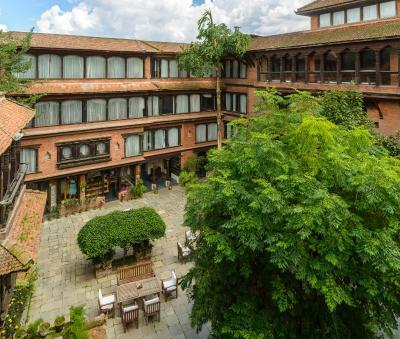 Pashupatinath Temple is 1,650 feet away while Kathmandu International Airport and the Buddhist site of Boudhanath are both 1.2 mi from the hotel. 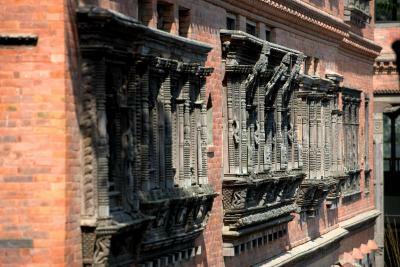 Durbar Marg Street is 3.1 mi away. 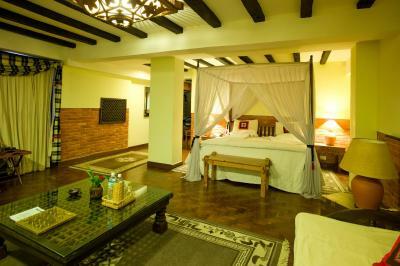 The air-conditioned rooms, which are equipped with a satellite TV and seating area. Private bathroom comes with a bathtub, shower and free toiletries. 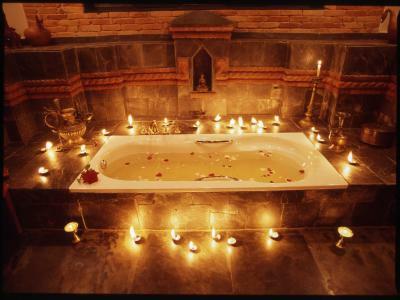 Recreation facilities available include massage services and a spa. A 24-hour reception welcomes guests. Free private parking is provided. 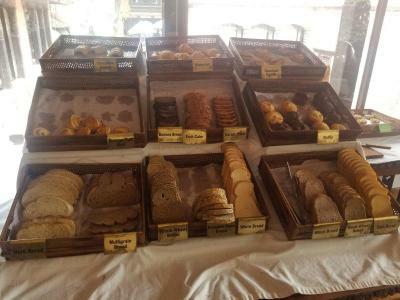 Guests can choose to dine at Krishnarpan, which specializes in local cuisine. 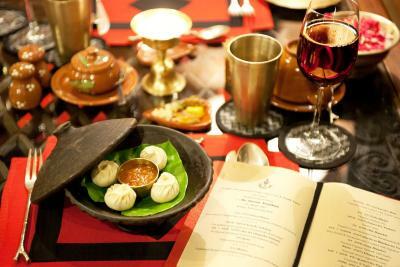 The hotel also serves Japanese dishes at Mako’s and Continental dishes at Toran. Local and international drinks can be ordered from Fusion Bar. When would you like to stay at The Dwarika’s Hotel? 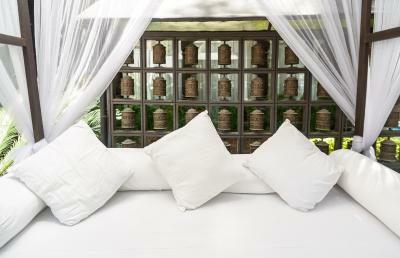 Air-conditioned room features hand woven linen and custom designed, hand made furnishings. It includes a satellite TV, seating area and private bathroom with bathtub, shower and free toiletries. 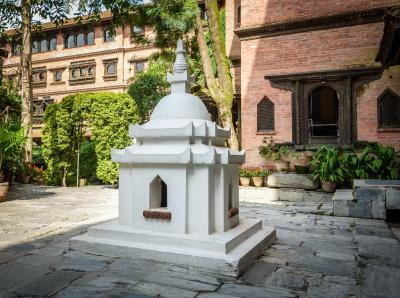 It offers view of the courtyard. 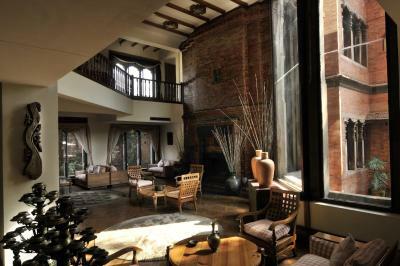 Large, air-conditioned suite features furnishings consisting of local materials including pottery, slate and brass. 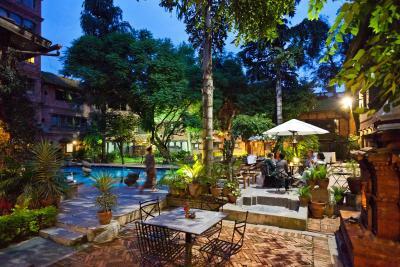 It has a satellite TV, seating area and private bathroom with bathtub, shower and free toiletries. 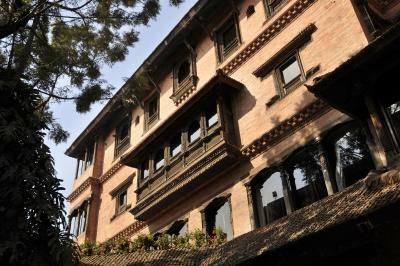 It offers view of the courtyard. 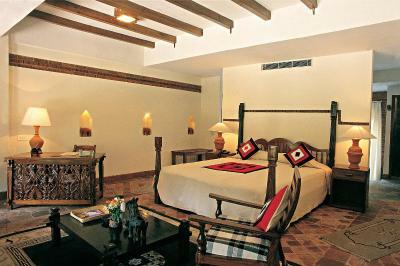 Every suite comes with a diwan (day bed) for guests to lounge on and is fully equipped with amenities. This suite has a seating area, tile/marble floor and cable TV. 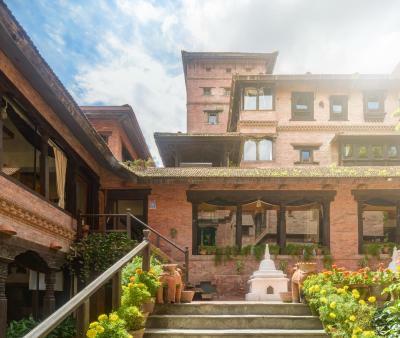 Offering Traditional Nepali hospitality, every suite comes with a diwan (day bed) for guests to lounge on and is fully equipped with amenities. Complimentary WiFi is available. 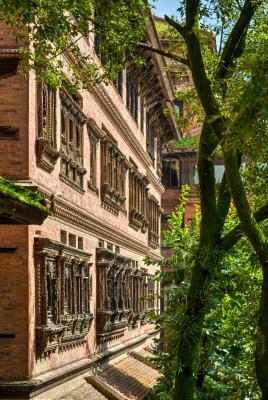 It offers view of the courtyard. 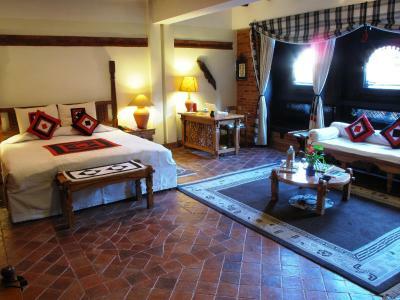 This single room features a tile/marble floor, satellite TV and air conditioning. 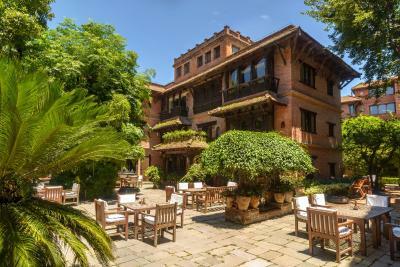 It offers view of the courtyard. 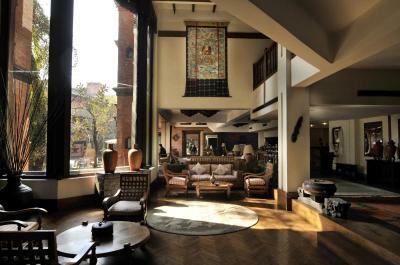 The suite is set over three floors with an open air breakfast terrace, a separate living area and an entrance foyer. 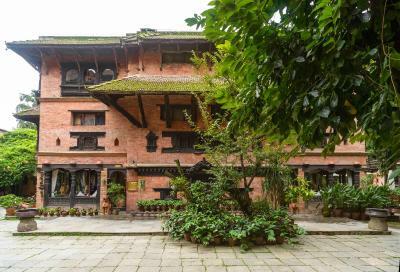 Featuring traditional Nepali architecture, the private spacious bathroom comes with a walk-in shower and bathtub. 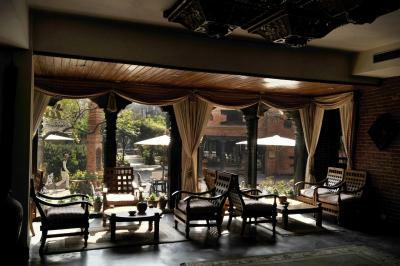 Guests can enjoy views of Kathmandu valley from the private terrace attached to the living room. The Suite also has a reception area on the 1st floor that can be provided with a secretarial service, fax and email. 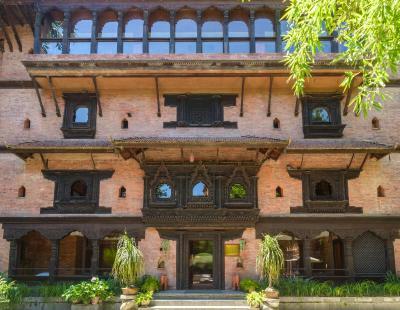 The Dwarika’s Hotel offers a regal experience comparable to that of the 14th century Malla Kings of Nepal. 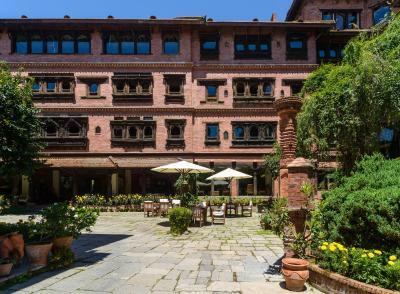 Each room has been individually designed to flawlessly engage a contemporary lifestyle with a flavor of Newari motifs and stylistic living. House Rules The Dwarika’s Hotel takes special requests – add in the next step! 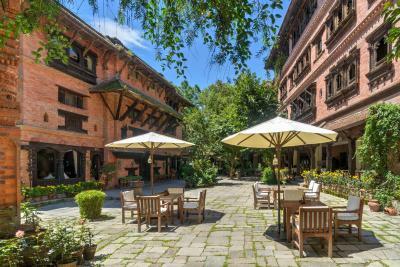 One older child or adult is charged USD 130.51 per person per night in an extra bed. The Dwarika’s Hotel accepts these cards and reserves the right to temporarily hold an amount prior to arrival. There wasn't anything I disliked however the breakfasts could be cheaper than what it is. I didn't eat much and still had to pay full price which was expensive. Other than that there are no complaints! Amazing room and hospitality. Such wonderful smiling staff. Nothing was too much trouble. 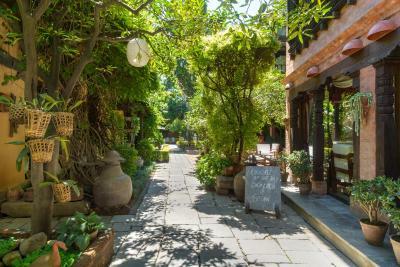 It's on a busy street but once you enter you are transported into a calming oasis. Loved this place!! Good food in KTM. Staffs are all very nice. From the moment we were picked up and from entering the property . We felt welcome and the architecture was absolutely gorgeous . I was travelling alone and stayed 2 nights at the beginning of my holiday and two at the end. On both occasions I was made extremely welcome, from the hot ginger drink on my arrival to the nightly hot water bottle delivered to my room. I was upgraded on my second visit and my room was incredible. Comfy bed, fabulous shower with superb products, everything was wonderful. 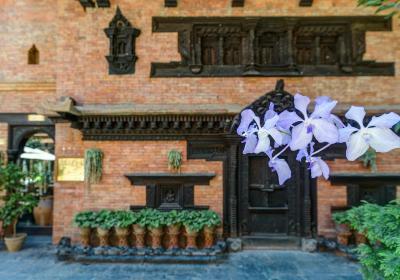 Visiting the workshop was worth it as the hotel is a museum showcasing local woodcarving skills across the centuries. 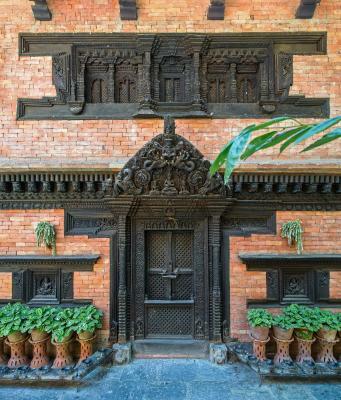 Reclaimed carved wooden doors, windows etc are made good by the artizans working in the workshop. Hopefully their skills will be passed down to future generations. It’s absolutely beautiful inside and out. The staff were so friendly and the bed was extremely comfortable. A little pricey - especially the food. 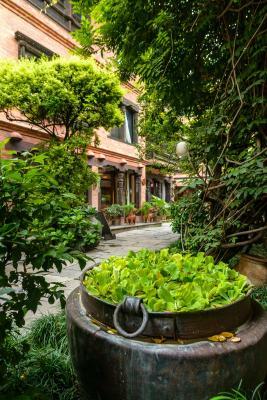 Beautiful property in the heart of a bustling and busy city ! 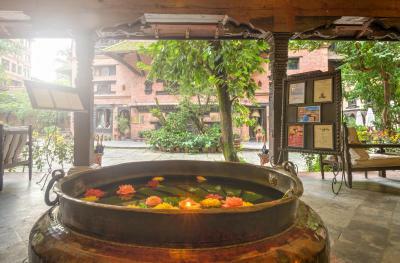 Tranquil atmosphere - welcoming and warm staff; lovely rooms - exquisitely designed. My little kids too enjoyed their stay here - especially how friendly and caring the staff were about their needs - special mention to Arjun on how he took care of us ! 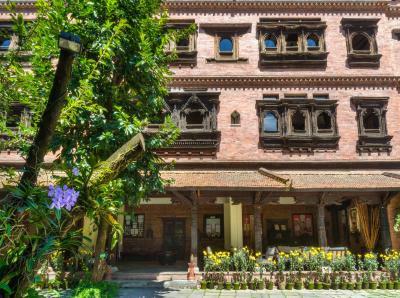 This would undoubtedly be the first property I would go to in Kathmandu!! Keep up the great work !! 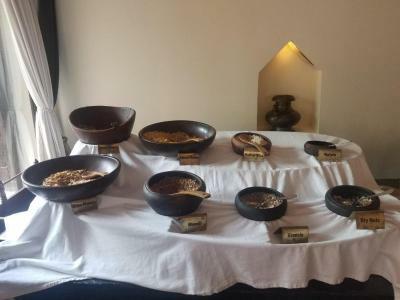 Breakfast was fine by Nepal standards, especially if you've been eating porridge and lentils on a trek for a week, but not up to 5* standards of other hotels in other parts of the world. Perfectly edible but nothing amazing. We had a fabulous room (a suite) but walking past the more standard rooms, they looked much less special. Pool v cold if you're travelling in the peak autumn-spring seasons. Location great for being close to airport but no restaurants nearby. Taxis to Thamel cost about £2-3 each way though. 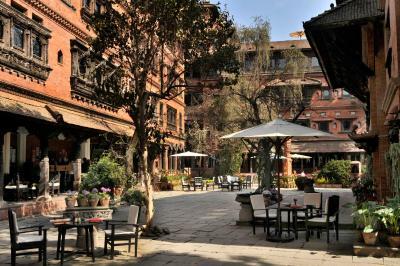 Would avoid the restaurants - food was very hit and miss and very expensive for Kathmandu. 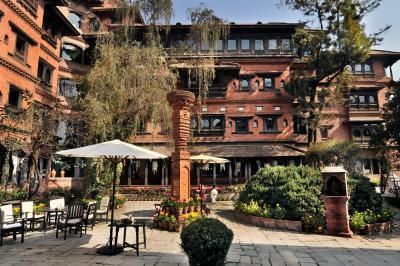 We avoided the Nepalese 'fine-dining' as it appeared v tacky and a tourist trap. 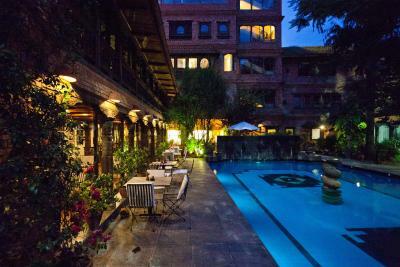 Finally as some constructive criticism, turn down the spot lights that illuminate the courtyard each evening. They have done a lovely job filling the place with candles and the trees with fairy lights around the outdoor seating and bar areas - why ruin such a lovely atmosphere with prison yard floodlights?????? Very much an oasis. Bed very comfy - only actual soft bed during our whole stay. Room was huge. Water was hot. Taxi rank right outside the hotel. Lovely pool area. We paid $400 a night which was expensive but needed after the hectic and exhausting trip - very much a perfect way to end our visit. Spa was also excellent. Again expensive by Kathamandu standards but worth it (£50 for a 60 min massage including all taxes) Worth noting - this is not quite as 'polished' a 5* hotels as something like a 4 seasons in the west might be, but more than makes up for it with charm, character and individuality coupled with great service and comfort. We preferred it to more sterile environments. 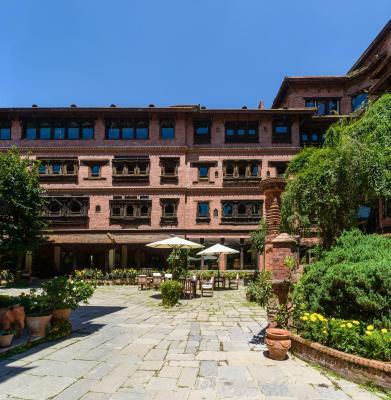 Phenomenal property in the middle of Kathmandu, like living in Nepalese kings palace. Fantastic breakfast. One of the nicest hotels we have ever stayed at -Jr Suite was wonderful! Dining options were excellent and staff very friendly and accommodating.